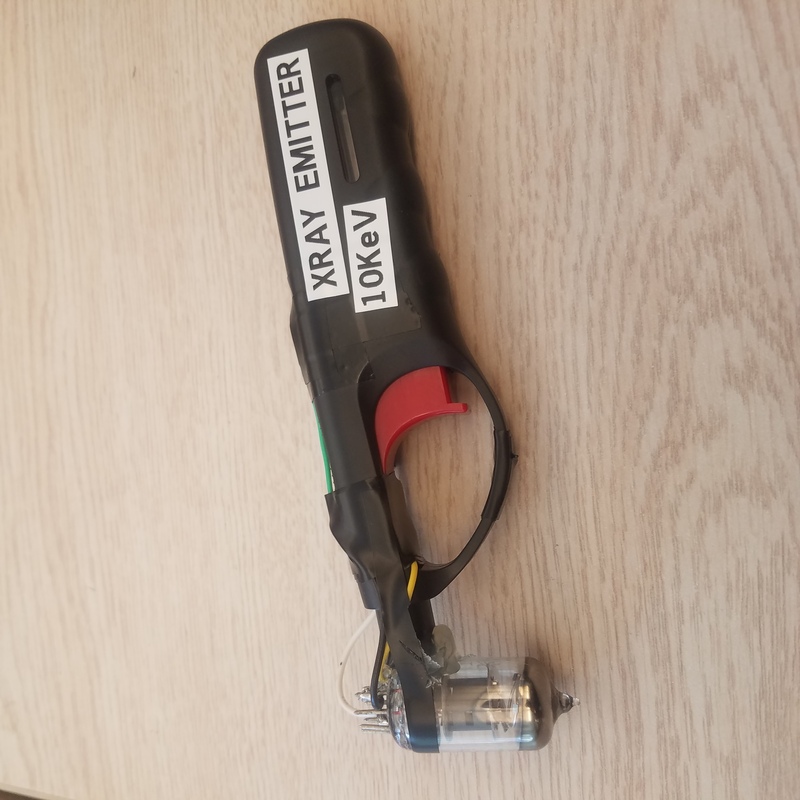 Portable device that emits XRays when the trigger is pulled. No battery necessary. Can be used to safely test radiation detectors. This project was created on 05/10/2018 and last updated 5 months ago. I&apos;ve built (invented?) a small, lightweight device that emits an XRay pulse when you pull a trigger. No battery is necessary - all energy produced via XRay emission comes directly from the energy put into pulling the trigger. As far I know I&apos;m the first person to do this with a lighter/piezoelectric, so that&apos;s cool! The XRay pulses produced are short and relatively weak, but register on geiger counters. 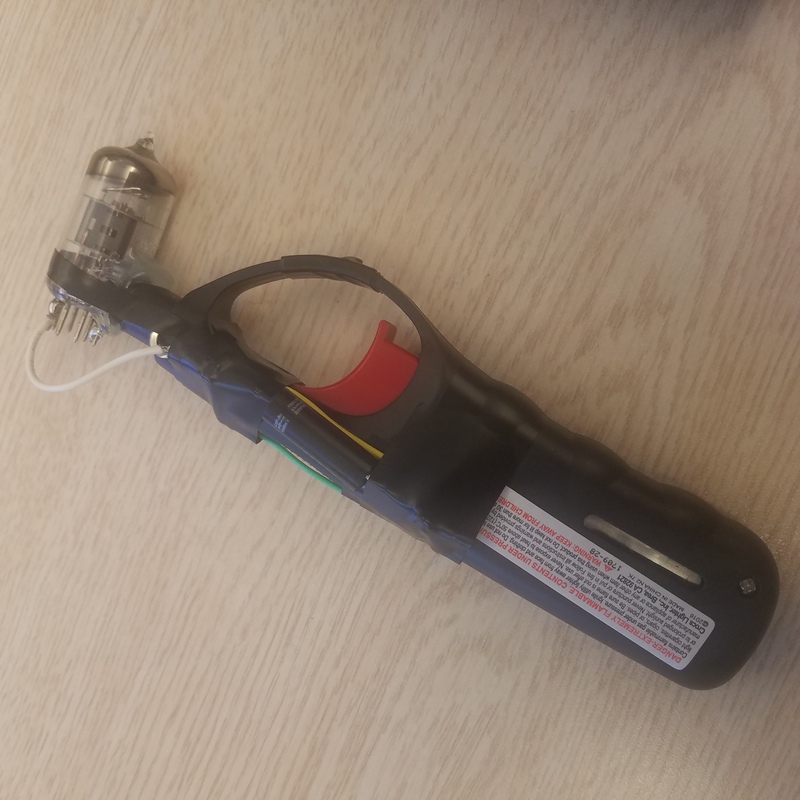 This makes the device probably the safest way possible to test a radiation detector, since radiation is only emitted on a trigger pull and the radiation pulse itself is not very strong. I&apos;m not one to be paranoid about radioactive sources (the ones you can find are totally safe if not consumed), but this device is so safe that any radiation risk can effectively be ignored. When sufficiently high voltage is applied across a vacuum tube, electrons can tunnel out of one of the terminals and accelerate across the tube, arriving with a kinetic energy of 1 electronvolt (eV) per volt crossed by the electron. Upon arriving at the positive terminal, the electrons smash into the metal, producing braking radiation. All charges emit electromagnetic radiation when they are accelerated, so when a very fast electron collides with a metal target, very high energy photons can be produced (up to the kinetic energy of the electron itself). This means that running high voltage across a vacuum tube will produce XRay photons, with a broad spectrum (ending at the maximum kinetic energy corresponding to the voltage across the tube). 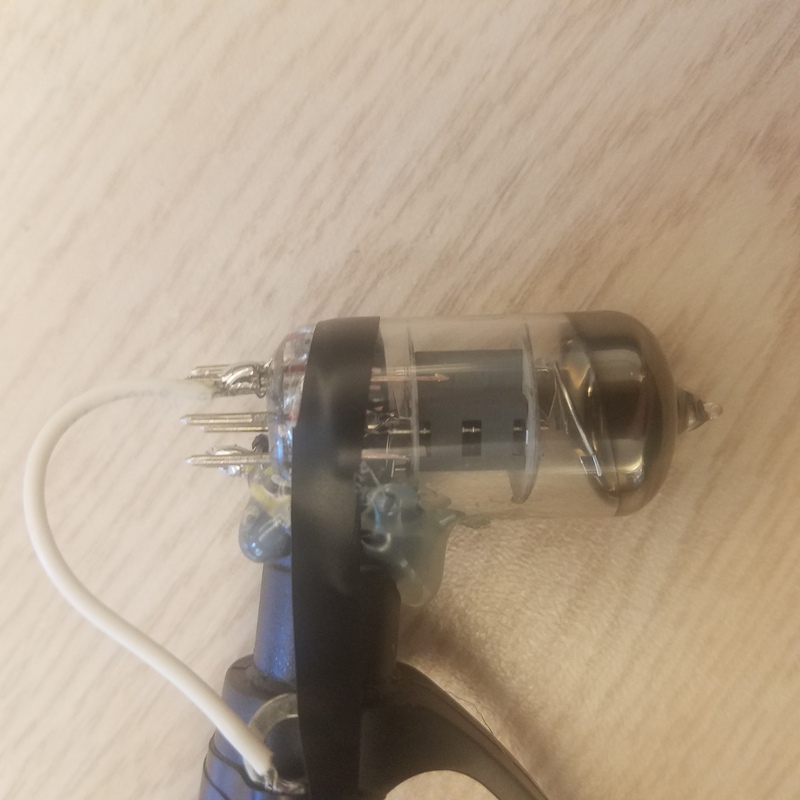 While testing some 6J1 rectifier vacuum tubes I&apos;ve had for awhile for XRay production (using a 20000 Volt CRT TV derived power supply) I remembered that barbecue lighters produce very low energy high voltage pulses. When you pull the trigger on a lighter, a small piston strikes a piezoelectric crystal, producing a very high voltage across the crystal. 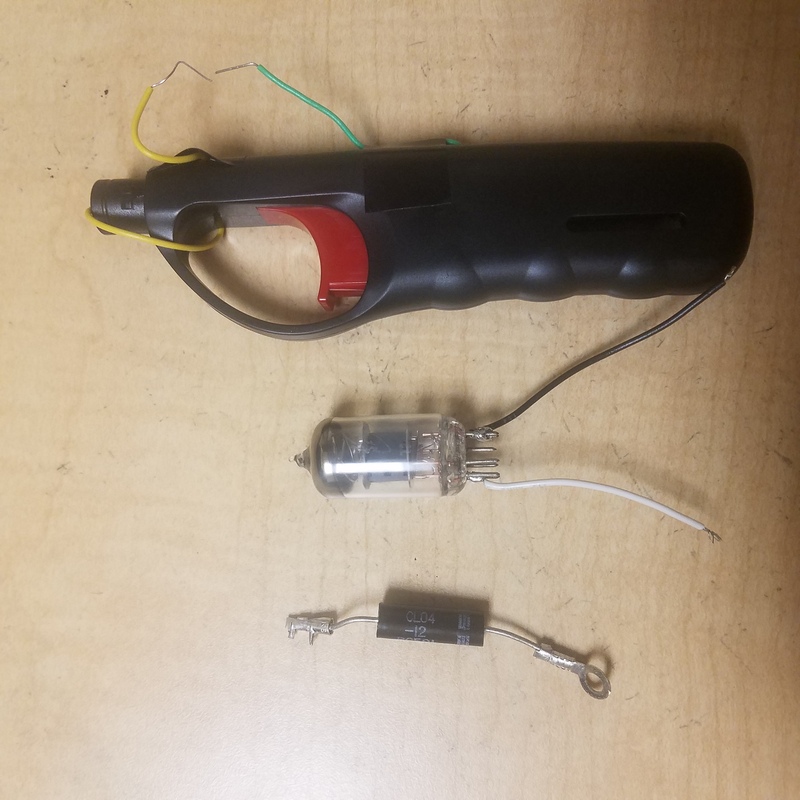 Hooking up a modified lighter (no gas feed lines, electrical leads exposed) to the 6J1 tube produces small, harmless pulses of XRays I was able to pick up on my geiger counter (CDV-700 as well as a SBM-20 based Ukrainian counter). I was confused to find that after 5-10 XRay pulses using the lighter, the tube would stop working and no more XRays would be produced. Taking off the tube I found that the lighter wouldn&apos;t even consistently produce high voltage arcs anymore. My idea (which turned out to be correct) is that the vacuum tube is acting as a high-voltage capacitor, which is charged up by the piezoelectric crystal&apos;s initial high voltage pulse. This capacitor is mostly discharged by the electrons accelerating into the target and producing XRays, but eventually the voltage drops to a point where less electrons are able to tunnel out. By now the piezoelectric crystal is totally discharged, causing current to flow back from the capacitor (vacuum tube) through the crystal, permanently damaging it. Adding a semiconductor diode in series with the positive terminal of the piezoelectric crystal to prevent current from flowing back into the crystal solves this issue. Not just any diode will work, though. For example, I originally tried a 1N4001 diode as I had a ton of them lying around. After soldering it up I realized that with a maximum reverse voltage of just 50 volts, this diode would probably fail, with the charged up tube punching right through it to destroy the crystal. I tested it anyway and sure enough, the lighter was damaged and had to be thrown away. Wire the filament of the rectifier tube to the negative output of the piezoelectric crystal. Wire the top plate of the tube to the negative terminal of the microwave diode, then wire the positive terminal of the diode to the positive output of the piezoelectric crystal. Pull the trigger and watch your radiation detectors click. I wouldn&apos;t worry, the x-ray dosages acquired by using this device are incredibly insignificant. The amount of x-rays detected with the tube right on the geiger counter are roughly equivalent to the dose obtained from a single background radiation hit, of which there are 10-20 per minute. Constantly pressing the button with the tube pressed against the skin might be able to come somewhat close to the dosage acquired from holding a weak radioactive source like uranium ore. I&apos;m willing to bet that a single dental X-ray irradiates you with more dose than this thing could produce over a month of pulling the trigger. I must tell U that this is a very dangerous project which poses a serious risk to UR health from exposure to X-rays...U should be emphasizing those risks in UR description. You are about to report the project "XRay emitter device made from a barbecue lighter", please tell us the reason.